For corporate startup collaboration, failure must also be an option. This is what it takes to succeed in the innovation. The big idea: After 3 years and 1 000 startups rated for more than a hundred corporate clients, it is time for Early Metrics to share some key learnings. 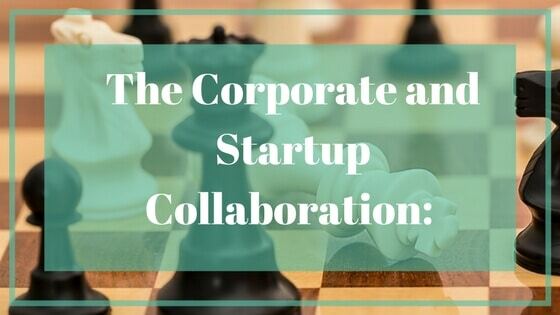 On our second installment, we’ll talk about the must do’s for a corporate-startup collaboration to be successful. When startups and a corporation collaborate, the motivations for both parties is central. It should be the case in any business interaction. But the differences in sizes and the variety of possible collaborations make it even more important when they start to work together. The fear of the Intellectual Propriety hold up is a common question in a startup CEO interview. While large corporations would say ‘startups see us as the guys with deep pockets and direct access to the market‘. But they don’t understand how they’re organized. They also don’t see and how decision-making process actually works in the corporate world. They may still be some misconceptions on both sides. The objectives of collaboration will always be the main solution to overcome miscommunication. – … as a compliance partner, etc. It is important to note that having the corporate as a shareholder (minority or majority) is not on the list. When it comes to equity stakes, investment or acquisition is the consequence of a great partnership. It involves one (usually more) of the points cited above. – …as a technological partner, etc. It is important to have a transparency in a corporate-startup collaboration. They have to formalize their targets and to know the ones of their counterpart. For corporations, many stakeholders are usually involved. The project leader also needs to ensure internal alignment. When it comes to measuring the success of a social media campaign or the launch of a new product, both parties are in their comfort zone. When it’s about measuring the success of a POC between a young fintech and a Tiers 1 bank, things become a little harder. Step 1 -Ask is the success of the collaboration can be quantifiable or based on an “it works, it doesn’t” model? Step 2 – If success quantifiable, then decide which are the KPIs to track. It should not only be vanity metrics such as the number of page views or likes. It is also important to note qualitative metrics such as conversion, retention, etc. Step 3 – Define the targets for the chosen KPIs without forgetting alignment. This is the order of magnitudes and challenge feasibility. Step 4 – If success is not quantifiable, define the characteristics of the output. It should not allow a clear judgment about success or failure of the collaboration. Rule #3: It’s still about the handshake – the one person rule. DM, BO and US. Not familiar with these terms? As a startup, you must get used to understanding the Decision Maker, Budget Owner, and User. In any large organization, these roles split between 3 to more people. Getting the final YES is very much dependent on having these profiles on board. To ease the collaboration, it is key to identify an internal Champion that has the greatest roles mentioned above. It is easier when the Champion is at least the User of the service. It is harder to be someone who is unfamiliar with what challenges the solution/service eases. If startups have the responsibility to identify and convince this internal sponsor, it is also true (but usually more natural) the other way round, and having the internal Champion reach out to the startup. Maximizing transparency during conversations between the Champion and the Entrepreneur is key. Including hard topics such as tech or payment delays, etc. From the startup perspective, considering the large corporate as the deep-pocketed guy that will pay for anything that has some kind of wahoo effect is both a huge and a common mistake. Large corporations are rational when it comes to expenses. They usually look for cost cuts at all levels, including digital and innovation. The higher the figure, the more stakeholders involved in the decision-making process. The more stakeholders involved, the lower the chances to make it happen. This is why the pilot/roll-out structure is the best way to go. Phase 1, Pilot – Generating the first success case. The goal is for both parties to define the first use case of collaboration. – It has to be as small as possible in size, to limit the number of decision makers involved. Targeting a size (understand the amount of €, $, £) that allows avoiding procurement/compliance and management validation is usually a good idea. – It has to have the highest chances of success. For a pilot, avoiding redesigning, integration, or re-branding, is usually another good idea. Phase 2, Roll Out – Deploying on a larger scale, using the experience of one or several pilots. Thanks to the data and information gathered during pilots. Skeptic colleagues are convinced and procurement reassured. Reaching this phase is rewarding for both parties, and when the collaboration between a corporate and a startup can excel. One of the main success factors of a corporate-startup collaboration is to establish a relationship that is as normalized as possible. Being mindful not to play too much on each party’s bargaining power and having a frank conversation when needs arise. The Article The Series: Startups and Corporates Part 2: Key rules of the game was written by Antoine Baschiera, CEO & co-founder at Early Metrics.